Mrs. Teri's Class begins their morning with the Pledge Of Allegiance. We offer Kindermusik classes during school hours and for Wednesday extended day with our older children. 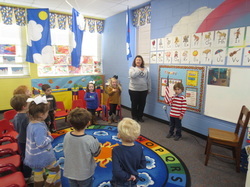 The children who participate love Mrs. Bonnie Henry and her active, playful music time. 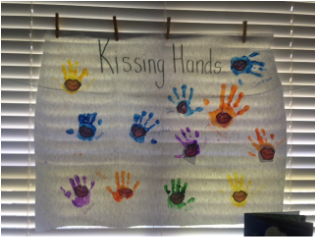 Mrs. Shannon's class made a poster to display in their classroom after reading The Kissing Hand by Audrey Penn. Mrs. Gloria's class practices hand-writing skills. The infants and toddlers really love being at school! They enjoy playing with toys, listening to a story, dancing and learning to walk!! Students in Ms. Shannon's Pre-K class have been enjoying a unit on apples to welcome fall. The children have experimented with sliced apples in different liquids and recorded their guesses, along with tasting different apples and making a graph on their favorites not to mention creating apple trees from toilet paper rolls, pom-poms and popsicle sticks. Students have read several books about growing apples and what foods come from apples. They even had a yummy apple pie one day for snack! Now, they are enjoying their own apple orchard, café and roadside stand. Don't forget "An Apple a Day Keeps the Doctor Away!" Students in Kindergarten, Pre-K and Preschool enjoyed a day dedicated to the Wild West! Children had been learning about cowboys and cowgirls, growing up on a ranch, and the special animals you find in the west. For a special treat, horses came to school to give all the children a chance to be a cowboy/cowgirl for the day! While the children were waiting their turn to ride, they were entertained by traditional western games; horseshoes, cattle roping, and horse racing. For a snack the little cowpokes enjoyed biscuits and bacon. The Preschool, Pre-K and Kindergarten classes had a great time carving the class pumpkins. Everyone got to take home some pumpkin guts! Yucky! The children went to Vicksburg Convalescent Home to entertain residents with Halloween songs and to trick or treat! They also stopped by Mutual Credit Union and Hall's Florist and Gifts! It was a really SWEET day! Every year the children work hard to present the Christmas story for their parents and special guests. Christmas is a magical time around the Kindergarten and Preschool with elves, music, special treats, and the Christmas program. The older children even spread Christmas joy to the residence of Vicksburg Convalesce Home. This year included a special treat, a visit from Santa!!! Ice Cream, Ice Cream we all scream for ice cream!! The PreK class has opened an Ice Cream parlor for their latest center! The children are scooping up ice cream (working on fine motor skills), filling orders (learning how to listen and follow directions) and working the cash register (practicing money skills) not to mention having a wonderful time!! The children have read books and watched a video showing how ice cream is made, named and graphed their favorite flavors and enjoyed a special ice cream treat for snack. Learning can be fun and tasty!! The Kindergarten and Preschool recently purchased IPads, speakers, headphones and video equipment to enhance our program. The teachers are able to use the IPads for a resource to further explore different topics and themes. For example, the Preschool class after studying Australia, watched a video projected from the IPad showing different animals, the people and culture and scenes from around the continent. The PreK students have a center set up with learning games that help with matching, problem solving, spatial relationships and much more. We are having fun learning that old-fashioned and technology-based learning can coexist. Thumper the Bunny comes to visit!! The Preschool Class had an early Easter surprise with a visit from Thumper the Bunny. The children learned how to care for Thumper and got to touch his soft fur. Happy Easter!! All the children and teachers enjoyed a free train ride from All Aboard Trains! The children have been studying transportation and things that move so, the train ride was a real treat! !